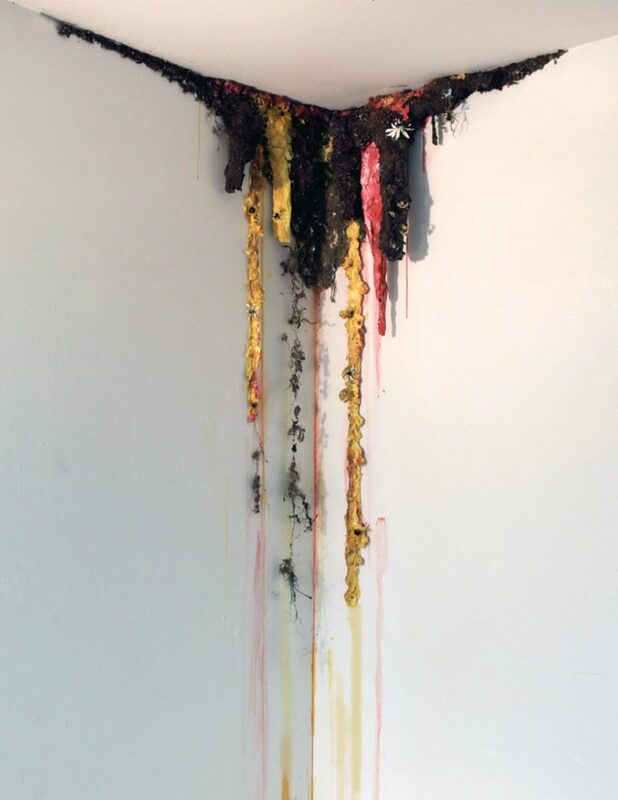 The vitality of Sarah Meyers Brent’s work is immediately apparent, for it spills and oozes out of every crevice it occupies. Brent’s works are visceral and living, springing from walls, seeping from the ceiling, unable to be contained by a concrete space. Her work has been compared to a garden, and it is undeniable that growth is integral to each piece, for its forms and materials suggest associations with the natural world and symbols of fertility. Yet, the use of “still life” in describing Brent’s work is also applicable, for each work contains carefully crafted elements that chronicle moments in the artist’s life, and significant periods of growth and change. There is an element of mystery and the grotesque in the decay in Brent’s works, but it is an alluring, sublime beauty. Brent’s process is reflective of her lived experience and materials are integral to understanding the work, which envelops the viewer, physically engaging us with her process.